Project Home :: A series of theatrical dialogues that will tour into different community venues across Metro Vancouver, to engage communities about how we can identify and transform the fears that hold us back from building healthy communities and caring for the environment. March 10 to 27, 2016 Community Tour Events • By Donation at the Door. None of us here at Theatre for Living (formerly Headlines Theatre) believe the recent change in the Canadian Government means that all of Canada’s issues are suddenly solved. After years of being governed by the Harper Government, that sacrificed the well being of our communities in the name of the economy, we know that it’s going to take a lot more than a change of Government to create a more balanced society; one in which we nurture communities and the environment. The fear of losing our economic prosperity is deeply aligned with the global fear of “terrorism” – and affects the way that we relate to one another, to the Indigenous population, to immigrants and refugees, and to others in our community. The fear of losing our economic prosperity is linked to our fear of losing our lifestyles, and our privileges – it is linked to our fear of the unknown. What are the fears that hold us back from taking care of one another and the planet? Reclaiming Hope, intends to be a platform from which we can dialogue about how we can change these attitudes that are embedded within ourselves and the collective psyche. How can we challenge these fears and find balance so that the decisions we make are good for individuals as well as communities and for the environment? How can we change our relationship to those fears? What will Reclaiming Hope look like? Each event will naturally shape itself into a different specific focus, based on the demographics of the audience that night. This will be determined by the audience the specific “host” is drawing on for the event. An audience will gather. David Diamond, Theatre for Living’s Artistic Director/Joker , will do a quick introduction and warm-up, grounding the audience in the subject matter. Then he will ask for three volunteers to offer stories from their own lives when they were challenged inside themselves by a moment that was affected by a fear-based value system. We’d be looking for a story where the person offering the story was challenged by a sense of fear, to go against their own inherent values. Stories will be offered and the audience will vote to focus the event into one of the stories – the one that resonates the deepest inside the room. That story-teller will remain inside the theatrical event for the evening. Having said that, our purpose is not to psychoanalyze this person. Their story is a gift that the whole audience ends up owning. Their story becomes a symbol to access and work with the psyche of the community – something theatre is very good at accessing. We will put the relevant moment in the story on the stage with either the story-teller alone or with another character, played by another audience member. This depends on the nature of the story. Then, we will start to identify the voices inside the story-teller’s head (inside our heads) that want us to believe that (for instance) economic growth is more important than human and environmental rights or that that closing borders is an answer. Keep in mind the exact content will change at each event based on the demographics of the audience. . How does this argument play out in what may seem like inconsequential moments, but which in fact are moments that determine our choices and behaviour? These voices will be portrayed by audience members who recognize the voices inside their own lives. We will inhabit the stage with the voices. Then, turning the theatre into a laboratory, we will use interactive theatre techniques to work on one voice at a time, inviting audience members to try to change our relationship to the voices. The process is entertaining, fun, full of surprises, laughter, insight and poignancy. It is grounded in the certainty that the community itself contains knowledge essential for transformation. We share and learn from each other’s insights. Community is built amongst people who were strangers. We leave the event with deeper knowledge of each other and ourselves, and tools to create healthier inner worlds, families and communities – and because of that, the ability to take action to create healthier structures that surround us. It is the shifting psyche of the Nation that creates the fabric of the Nation and also elects and then holds Government accountable. Part of our plan is to invite local Councilors, MLAs and MPs to the events with the express desire of having them experience specific events. For instance, for an event that is hosted by an organization that is engaged in issues with immigrants, we would invite politicians and their staff who work specifically on these issues. Theatre companies in Austria and New York who do work related to our own, are finding policy shift success with this model – having politicians and staff (policy-makers) experiencing the event, rather than receiving a report about it afterwards. "Corporations in our Heads was thought provoking and uncomfortable at times and has been in my head running playback since. What Theatre for Living does is phenomenal! It is transformative and takes the audience on a journey that is deeply personal and deeply human and spiritual." Us and Them (the inquiry) (2010) looked at issues of othering. Are you interested in getting involved with Reclaiming Hope? We need help reaching out to ALL communities in Vancouver, and we can only do this with the help of people on the ground, and in communities - like you! 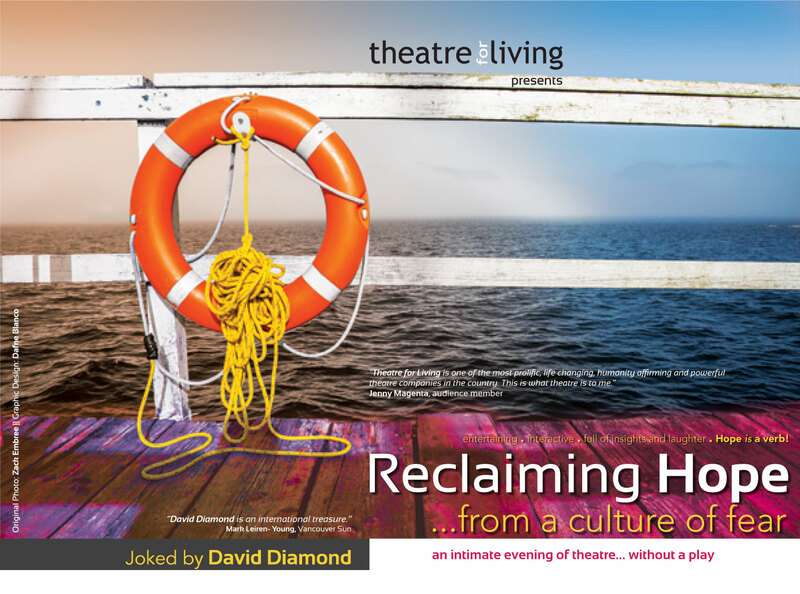 After the run of Reclaiming Hope, we will be inviting audience members who have attended one of the Reclaiming Hope events to a facilitated workshop at the Scotia Dance Centre on April 3rd. Participants will brainstorm tangible actions that they will be able to take back into their communities, to create the changes that we want to see in the world today - and Reclaim Hope. Reclaiming Hope is an adaptation of what we were originally planning before the Federal election.